G’day and welcome to Swags Under Stars. This unique tour is swag camping at its finest! From our Cairns base in North Queensland we will guide you on a journey around this incredibly diverse part of Australia. 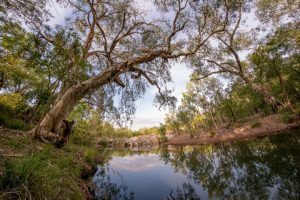 Our full three day tour will take you from world heritage listed rainforests, to the big skies of the outback; from classic Aussie bush to lush cratered tablelands. Engage your senses both day and night when, after sunset, you have a campfire to dine by and a carpet of stars to snooze under each night. This is a full 3 day/2 night swag camping experience based in Cairns, North Queensland. With this approximate 900km round trip you will take in a stunning variety of landscapes, flora and fauna with all native wildlife seen in their natural environment plus plenty of interpretation by your accredited guide. All meals are provided whilst on tour and both nights are spent in areas with considerably less rainfall than our origin in the wet tropics, so experiencing clear, starry nights is common during our tour. Hotair balloon ride on morning of Day 2. Savannah guided lava tube tour on morning of Day 3. From your pick up around Cairns we travel north, hugging the Marlin coast on this scenic drive to the wet tropics world heritage area. 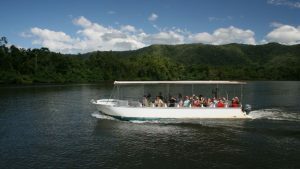 Our destination for the morning is spectacular Mossman Gorge in the world heritage listed Daintree rainforest, and we get to find out why it’s become such a highlight of visits to the north. A shuttle bus will take you into the heart of the gorge where we spend most of the morning. Immerse yourself in this ancient tropical rainforest with a 2km guided loop walk and ample opportunities for swimming in these pristine waters. Once we leave Mossman Gorge, it’s a short drive to our lunch spot by a tropical beach before we continue further north to the mighty Daintree river itself. 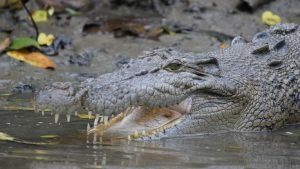 Learn about this magnificent river and the wildlife that inhabit it, including the saltwater crocodile, on a one hour guided wildlife spotting cruise. Refreshments, including a sampling of tropical fruits, awaits you after the cruise before we leave the rainforest behind us and make tracks inland over the eastern escarpment onto a higher, dryer, cooler climate. Road traffic thins out over the range and the change of environment also heralds a marked change in flora and fauna. We arrive at our bush camp in the late afternoon, located in the Mareeba valley, a rich food producing region. It is here we spend our first night camping in swags under stars. 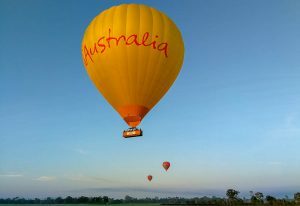 Mareeba is THE spot for Hotair balloon rides in North Queensland, so we are right in the playground! For those booked on this unforgettable adventure, it will be an earlier rise to rendezvous at the pick up location a few minutes drive away. Mareeba is also where the majority of Australia’s coffee comes from so we’ll have plenty of opportunity to indulge in some locally grown before we leave this area. We travel west mid morning over the great dividing range towards the spacious outback. As crop farms cease and vegetation thins out this regions fascinating geology becomes apparent. We journey from basalt, to granite, onto the impressive limestone karst of Chillagoe, an historic mining town with a prehistoric past. It’s here we hit the ‘old coast’ of eastern Australia. Where once elasmosaurus swam in shallow seas by coral reefs, we now have limestone towers and caves, with the odd spot pressure cooked over time to become exquisite marble. 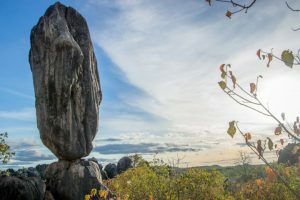 With limestone caves, marble quarries, heritage smelters and the balancing rock, there’s plenty to see and do around this little town and we’ll divide our activities with a cool swim around lunchtime. We’re in for a real slice of Queensland in the afternoon as we venture further inland, well off the beaten track. This classic drive threads our way through rocky hills along a scenic mining trail. 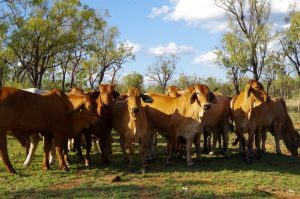 It’s great for wildlife spotting, with opportunities to stop for photos before we reach our overnight camp on a working cattle station in the late afternoon. You’ll really feel the serenity here, it’s great for nocturnal wildlife spotting and perfect for another night to enjoy a hearty meal, a campfire and to marvel at the stars. It’s another early morning rise courtesy of soft filtered sunlight through eucalyptus trees and bush bird alarm clock to wake you for your final day. The reluctance to leave is eased by the final days itinerary. Just half an hour down the road we get to experience Undara. 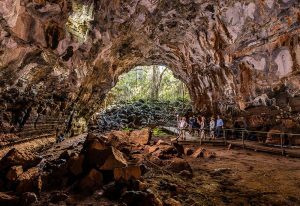 This great part of the outback in an all natural setting is the centre for the world’s most extensive lava tube system and those booked on a savannah guided tour will start at 8am. Here is a great opportunity to check out the native wildlife, converted train carriages or swim in the pool before our barbecue lunch. 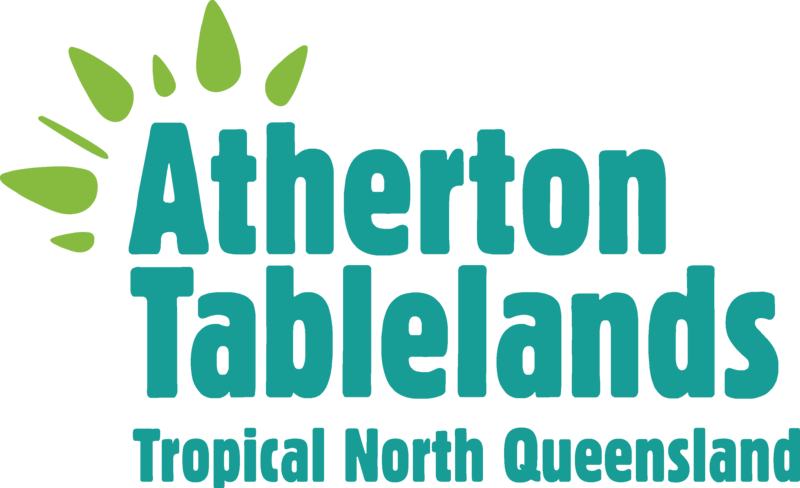 Afterwards we journey east towards the Atherton tablelands. Vegetation thickens as we travel towards this upland region until it’s sudden and spectacular rainforest return in these highlands. We visit Mt Hypipamee National Park, where you will see a stunning example of earth’s natural forces when peering down at the crater caused by a volcanic gas expansion blown out of solid granite! Also in this national park are Dinner falls, so cool and refreshing these rainforest waterfalls are perfect for a last swim on tour. 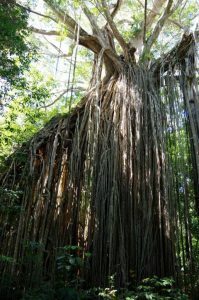 magnificent curtain fig tree, a fantastic example of a ‘strangling’ ficus, so awesome it has its own national park! By late afternoon we’ve descended the highlands, are back onto the coastal lowlands and returning to Cairns for the completion of our tour loop and three day adventure with Swags Under Stars.